ward off obesity-related diseases such as diabetes, metabolic syndrome, and cardiovascular disease. · have bioactive and phenolic compounds (anthocyanins, chlorogenic acids, quercetins, and catechins), along with anti-obesity and anti-inflammatory properties that reduce the bad cholesterol (LDL) associated with cardiovascular disease. 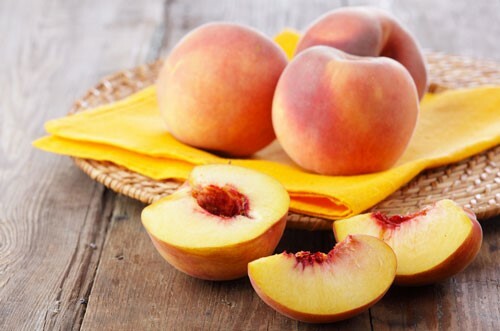 · are an excellent source of the strong antioxidant vitamin C, so peaches help combat the formation of free radicals known to cause cancer (especially breast cancer). · are exceptionally high in fiber, so they help in protecting against colorectal cancer. · nourish the skin because of their high vitamin C content (which plays a vital role in the formation of collagen, the main support system of your skin). · improve blood sugar, lipids and insulin levels, and lower glucose levels. · decrease the risk of and progression of age-related macular degeneration. MNT also mentioned that continuous research is showing that the benefits of consuming peaches (and actually fruits and vegetables of all kinds), are infinite. Almost weekly a new compound, trace element, or other health factor in fruits and vegetables is discovered. It’s not opinion anymore; it’s scientific FACT: As plant food consumption goes up, the risk of all lifestyle- related diseases (such as obesity, diabetes, and heart disease) goes down. So whether it’s peaches or another favorite fruit or veggie, high intake is also associated with disease prevention and protection, lower risk of mortality, lower weight and weight-gain prevention, increased energy, and healthy skin and hair. Make them into a main entree: Create a hearty salad by starting with mixed greens or spinach and adding dry-roasted nuts, diced fresh peaches, fresh mozzarella, and grilled chicken, salmon or tofu. Drizzle with a balsamic dressing. Pecans are especially good with this. Or top grilled chicken with grilled peaches. Wow! 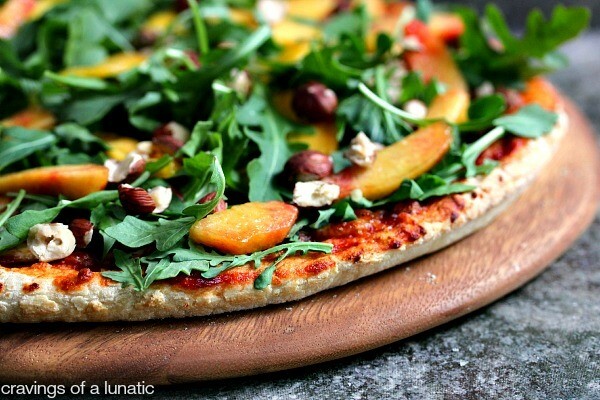 Or top pizza crust with thinly sliced fresh peaches, lots of arugula, and chopped hazel nuts. Another Wow! 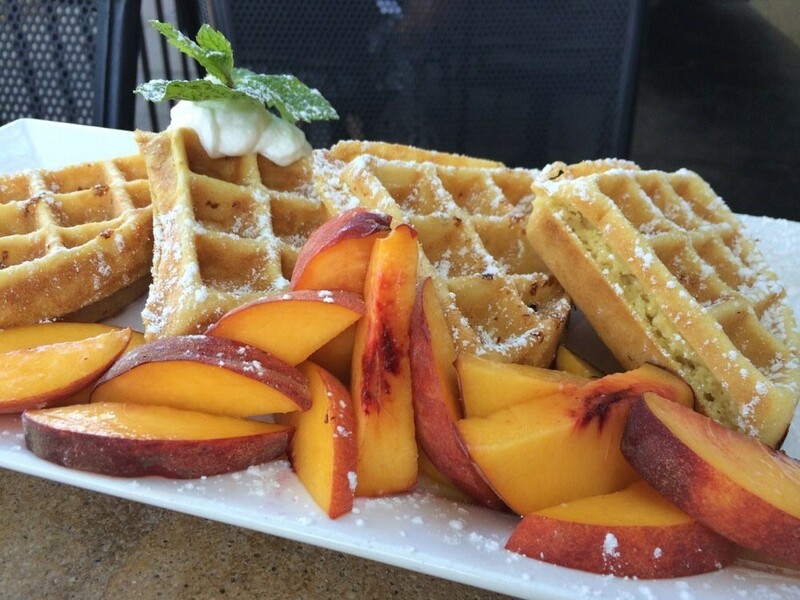 Make them the center of breakfast: Sliced peaches go great with oatmeal, granola, and cold cereals, and as a topper for pancakes, waffles, and French toast. 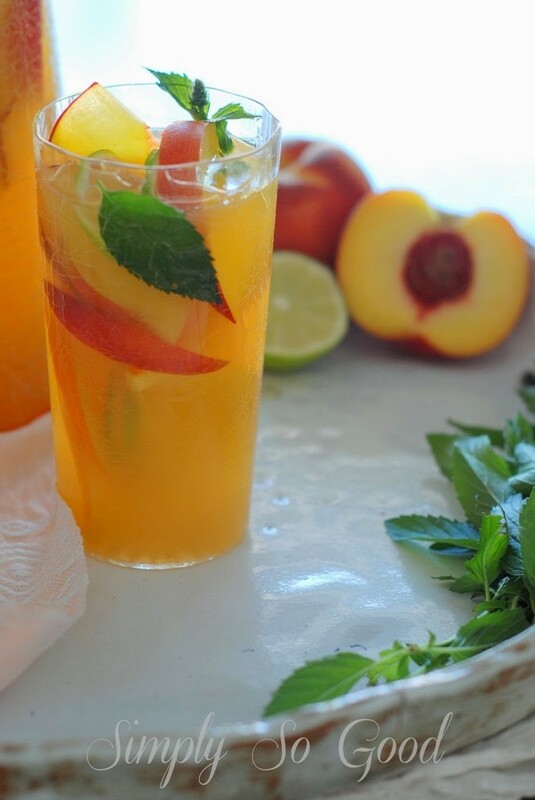 Make them the drink of choice: Muddle peaches into your glass of lemonade, iced tea, or water. This adds an extra, refreshing flavor layer. 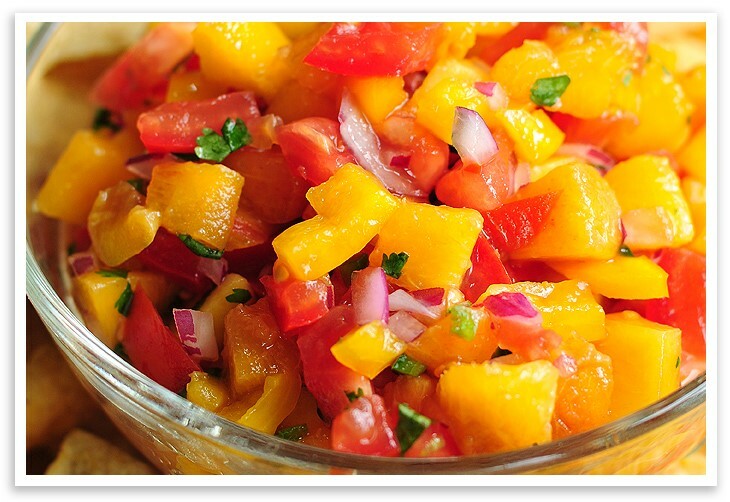 Make them the theme of your salsa: Combine diced peaches with mango, jalapeno, red peppers, and chipotle pepper. This salsa is terrific as a topper for your favorite fish tacos. 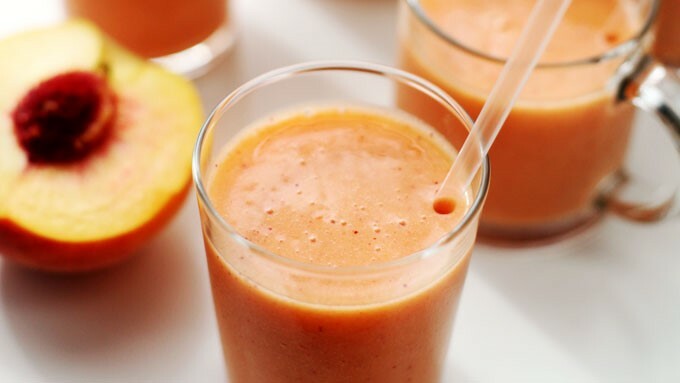 Make them the backbone of your fruit smoothie: Blend 8 to 10 fresh peaches, half a frozen banana, and plain Greek yogurt for the best smoothie you’ve ever had. The peaches liquefy so well that there’s no need for any extra liquid, so the vitamins and minerals are super-concentrated. I also add a handful of fresh greens when making this for myself. It’s as good as dessert. And speaking of dessert, make them into toppings for ice cream, add them to vanilla puddings and tapioca, and make them into cobblers, crisps, and pies. So with this dessert-related suggestion, how about a new twist on pie? Instead of the typical round pie, I tried a cobbler-type pie yesterday. I mixed 8 cups of fresh peach slices with 2 scant cups of sugar, 1/3 cup of butter, and 3 tablespoons of flour. I cooked this for a few minutes on medium heat, just enough to draw the juices out. Then, as this was cooling I made a batch of pie crust. And here’s where the fun starts. I poured half the peaches into a buttered 8- or 9-inch square pan. Then I topped the filling with a square of pie crust (rolled to a little less than ¼-inch). I baked that at 425°F for about 13 minutes. Next I removed that from the oven, poured the remaining peaches over this nicely browned crust, and topped these peaches with more pie crust. 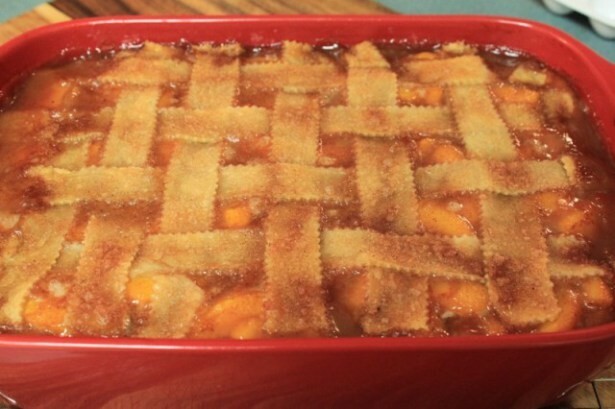 You can either just lay on another square or do a lattice topping as the photo shows. I baked it again for about 10 minutes (for lattice; longer if you use a full square). This was delicious—the crusts were crisp and the peaches ruled! We topped warm servings with vanilla ice cream and died and went to heaven. Now, in case any of you may want a fool-proof pie crust recipe, I close with the best recipe ever, from former Cook’n Monthly Newsletter writer, Jeanne Wolfley. There’s not one healthy thing about this superb crust, but once in awhile, who cares! 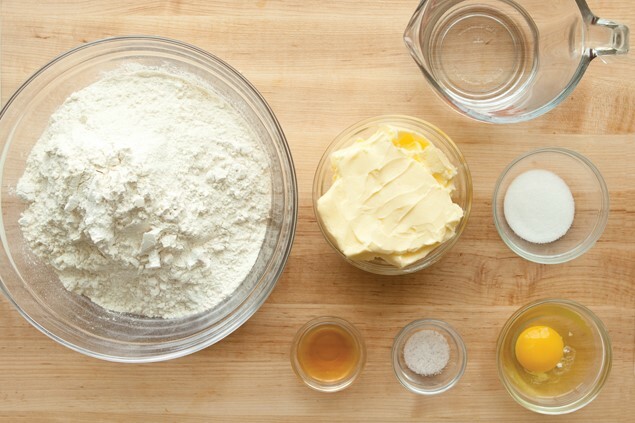 Using a pastry blender or fork, mix flour, shortening, sugar, and salt together until the mixture resembles coarse crumbs. Combine vinegar, egg, and water and mix well. Add wet ingredients to the flour mixture and blend quickly Be careful not to overwork dough; mix just until liquid is absorbed by the flour mixture. Refrigerate at least 15 minutes before rolling. 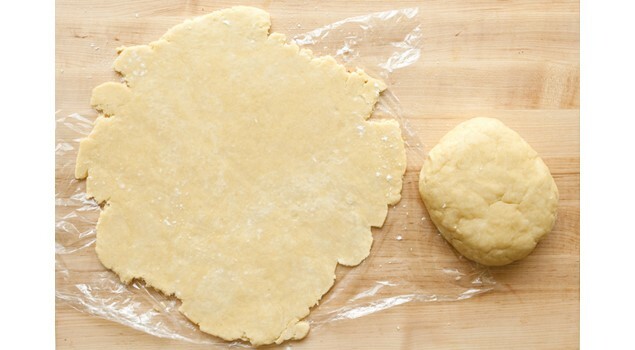 This dough can be divided into individual crust portions, wrapped, and frozen for later use.